I’ve been on the look-out for an easy to use gel liner for a while now!…As we all know it’s a little tricky to ace that perfect line & flick. So my next purchase has to be Benefit’s “they’re real! push up liner”. 1. I’ve always been a gel liner fan, but this is like no other I’ve used, so it takes a little getting used to. It’s a gel liner in pen form! The flexible tip allows for a more precise application so I can get really close to my lash line. I especially love the matte black finish. 2. They’re real! push-up liner is the best eyeliner I’ve ever used. You can get a very smooth line, right next to your lash line, and its so easy to customize your look. 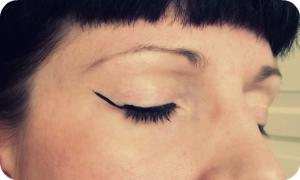 My favorite eyeliner look is the cat-eye which is so easy to create with this gel pen. The best part is, it doesn’t smudge or transfer by the end of the day! I definitely recommend trying this pen, it’s so easy to use, even if you don’t usually wear eyeliner! Note: you do have to turn the base quite a few times to get it going on your first try, but after that, just one or two clicks and you’re ready to apply. 3. Applying eyeliner has always been stressful but not with they’re real push-up liner! It’s really easy to get close to my lash line to create a thin, natural line. The pointed tip also makes it incredibly easy to create a wing look by angling it upward and pressing it against my skin to form the line. The formula lasts ALL DAY even post workout! LOVE! 4. It definitely took me a few times to get the hang of using it just because it’s SO different from any other eyeliner I’ve used in the past. But, now I love it! 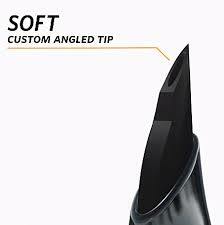 The tip is super sturdy so it provides more control to get the liner where you want, even with not-so-steady hands. I also love the fact that it’s a super dark black (much darker than my other liners) for BIG drama, and it’s waterproof so it stays on all day. My new favorite eyeliner!! So, if like me you want more of this!!….. …..and less of this!! I think we know what we need! !….I can’t wait to try it! Who’s Looking Great This Week?